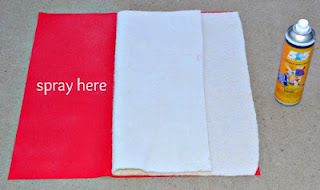 How to make a quick and easy placemat! First off, here are the measurements for you. 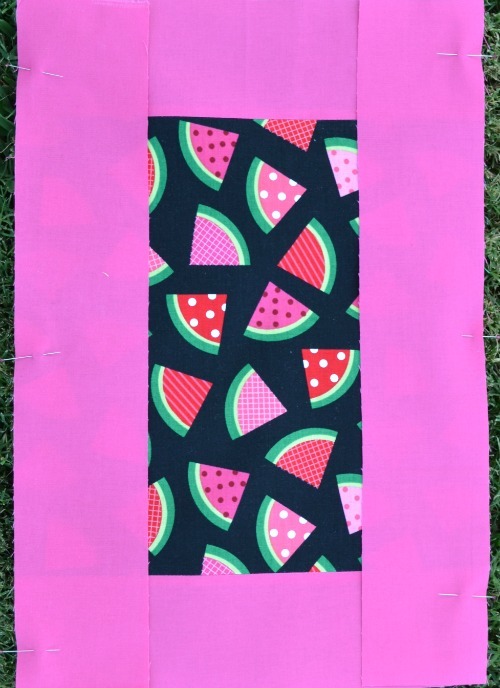 Here is the cut fabric for four of them. I considered another print for the borders, but I didn't want it too busy, so I just stuck with the solids. 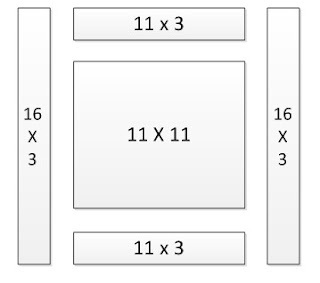 First off, sew the 11x3 pieces to your center square. Sometimes I pin, sometimes I don't. What about you? After you have pressed those two seams, do the same thing with your long sides. Press your seams and here is what your placemat looks like after that step. 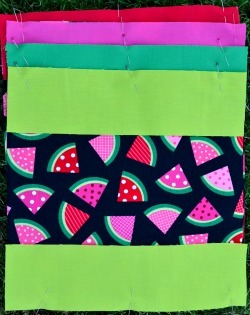 Now it is time to prepare the quilt sandwich. First I sprayed the backing fabric (red) and placed the batting on top of it. I usually do this in two parts, the left side and the right side. 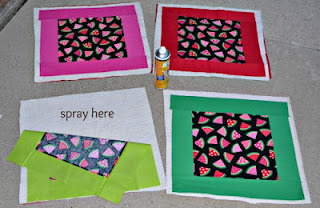 I spray, put the backing on, and then smooth it with my hands to get out any wrinkles. After that step, I do the same thing to the top. And then....it is time to quilt. I used straight lines 1 1/2" apart and then put on the binding and you are all set! Hey Julie! Loved your tutorial! I'm so glad we are sharing the same blog hop day! Hope all is going well! Thank you for the really good clear tutorial - I love the cheery fabrics you've chosen! 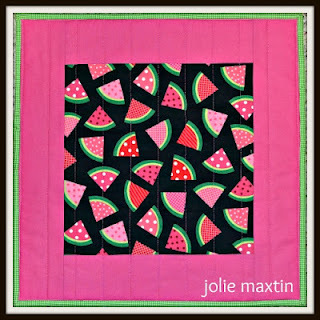 Dropping by from the Blog Hop. 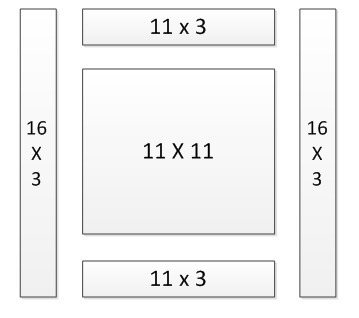 I really liked your tutorial, it was set out so well, the diagrams were really clear with just the right amount of text and pictures. Great post! 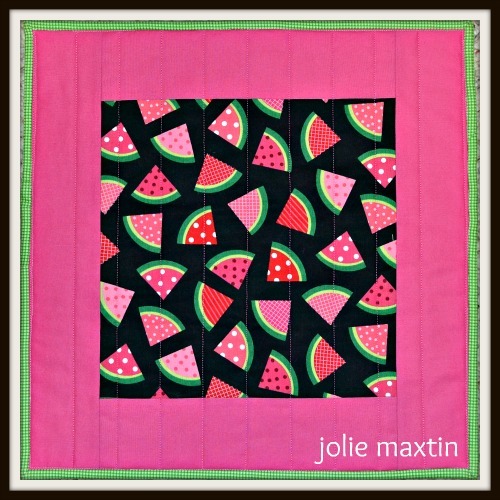 Very cute placemats, I love the watermelon fabric! 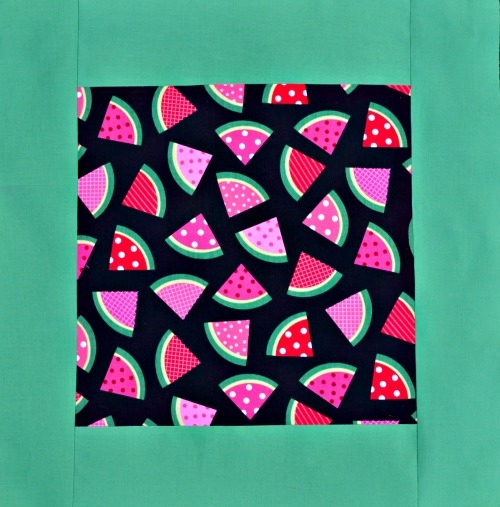 So fresh and great for the summertime! Jolie, I have fallen in love with that battign spray...doesn't it make life so much easier! Lovely to meet you! Great post a dn love the tute. I think your blog is really well set out, I love the header. That looks very easy. Thanks.